Brightpoint’s annual RECAP breakfast was held on Wednesday, May 4 at Ceruti’s Summit Park in Fort Wayne. 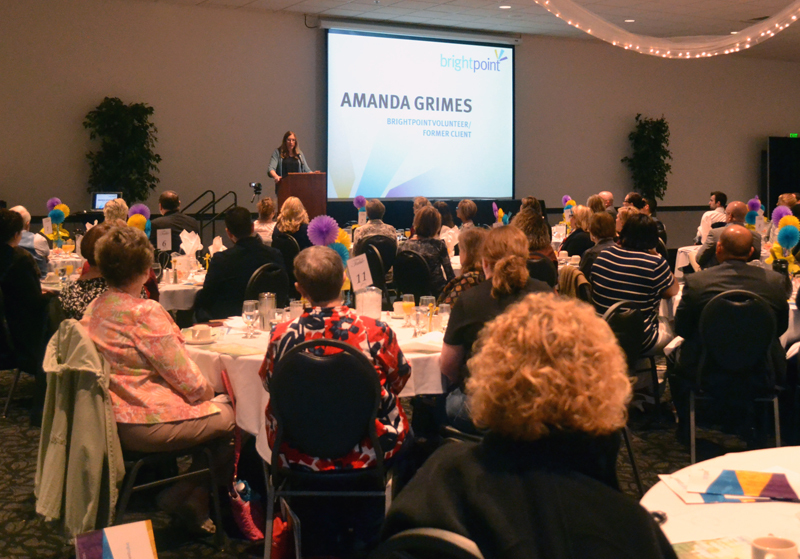 This year’s event featured keynote speaker Amanda Grimes who engaged the audience with her story. Amanda is a Brightpoint volunteer, but before that she was a client – something she thought she would never be. Amanda explained to the RECAP audience how she became homeless when she lost her job and how she received help at Brightpoint through the Supportive Services for Veteran Families program. Through her difficult experiences, she was able to emerge with a new perspective and a goal to help others. Awards were given out to individuals who have had success at removing the causes and conditions of poverty in their own lives by using the programs and services available through Brightpoint. This award, called the Bright Future award, recognizes that no matter what assistance is available, it can take considerable effort to move from where you are towards a brighter future. The nominees this year were Victor Carter; Michael Sanders; and Jason and Christina Snyder. Michael Chittick and Latanya Guinn took home awards in this category, but all of the nominees were celebrated for exemplifying the spirit of the Bright Future award. The agency also recognized the volunteers who have contributed to the organization through the Head Start program. The winners of the Outstanding Volunteer awards this year showed a commitment to Brightpoint and to making a difference for their children and the world around them. The winners were: Lloyd and Juliette Boggs; Nancy Edgell; Chelsea and Jason Kuse; and Misty Zent. The annual Outstanding Partnership award is given to the businesses and organizations in the community who have gone above and beyond to assist Brightpoint in meeting its mission. The nominees were: Chase Manor Apartments; Expressions of Spirit Inc.; Father Michel Holland – Holy Redeemer Catholic Community; Indiana Tech; Ligonier Rotary Club; McFadden Resource Center; and Mustard Seed Furniture Bank. The winner was Lutheran Social Services of Indiana. At the RECAP event, over 175 donors, partners, and community members listened as Brightpoint’s President/CEO Steve Hoffman shared reflections about the past year and the agency’s plans for the future. In 2015, Brightpoint celebrated its 50th anniversary as an organization while announcing the name change from CANI to Brightpoint and unveiling a new look. In addition, the Child Care Assistance and Covering Kids & Families programs expanded with new offices located in Huntington, Michigan City, South Bend, and Wabash. This growth led to the adoption of three new counties into Brightpoint’s official service area: St. Joseph, LaPorte, and Wabash. Brightpoint also saw the first expansion of its Head Start program in decades with the addition of the On My Way Pre-K voucher program. And toward the end of the year, the Brightpoint Development Fund received substantial funding to start a new program called the Community Loan CenterTM –which is offering affordable small-dollar loans through employers as a way of combatting payday lending. These accomplishments were highlighted at the RECAP event and are included in Brightpoint’s 2015 Annual Report which was made available to attendees of the event. The report is also available online here. Print copies can be obtained by contacting Marie McFadden at MarieMcFadden@mybrightpoint.org or (260) 423-3546, ext. 240.